Currently, a vast number of records, plans, photographs, drawings and other important information (some dating back to the World War 2) are stored in various locations around the country. Back in 2005, we began the NDA archive project, following careful evaluation of the options and costs. We decided to find a single UK home for all the relevant material. NDA focused the search for a suitable site within its 4 priority regions. These are areas where ageing nuclear sites have long been a dominant influence in the local economy and where site closures will have the greatest local impact. Caithness, with 2,000 people working in decommissioning, was selected as the region most likely to benefit. The closure of its major employer, Dounreay site, is set to become a reality by 2029/30. The Archive will be located near Wick Airport, not far from the Dounreay site. The NDA aim to develop the archive as a base for training archivists and offering apprenticeships, linking up with the University of the Highlands and Islands, and North Highland College. Around 20 full-time jobs will be created within the Archive, whilst the construction phase is likely to generate dozens of additional temporary posts andwill lead to opportunities for local contractors. 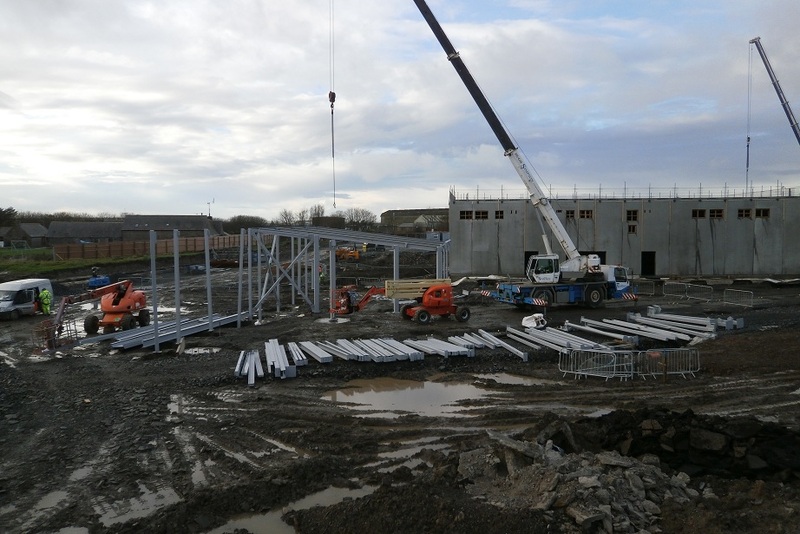 The floors and walls of the new NDA archive building in Wick have taken shape as construction work continues at the site near Wick airport in northern Scotland. The former World War 2 airfield site has already thrown up interesting construction challenges, including the surprise discovery of a large sub-surface concrete slab, which hadn’t shown up in old plans or preparatory ground investigations. Interestingly, when the construction team came across the concrete slab, they initially wondered if it might have been the footings of an old air raid shelter. Eventually they concluded it was probably associated with the electrical infrastructure. Full investigations had to be carried out before it was filled in and work could continue, but this demonstrates the value of historic records - which were incomplete in this case. The first piece of turf for the Archive was cut in summer, marked by an event for local stakeholders. Ground works and drainage works are now complete, while the erection of steelwork and construction of the entranceway started in November. A huge volume of records from across the nuclear industry, some dating back 70 years, will eventually be held at the facility. They will be available for study, research and supporting the decommissioning mission, for example by storing waste records. Much of the archive material will be in digital format as well as paper. The archive will include material from hundreds of thousands of boxes that have accumulated over the decades at Sellafield, Dounreay, Magnox sites, Harwell, Winfrith and other nuclear facilities that are scheduled for eventual demolition. Large quantities of additional material, meanwhile, are also held at off-site commercial storage locations. A ‘sift and lift’ process is currently under way across the estate to retrieve and examine stored records in detail before transfer, where appropriate, to the archive. Wick was selected for the £20 million national facility as part of the NDA’s commitment to help support local economies in areas affected by the closure of NDA sites. As the owner of decommissioning sites, the NDA is responsible for all relevant nuclear records, which must be preserved and made available in line with legislation on public information. The Archive is one part of a wider NDA programme which aims to ensure consistent, effective management of all kinds of information, knowledge and the professional expertise within the estate. All Site Licence Companies, subsidiaries, relevant government departments and the nuclear regulators are involved in the programme. Information governance (including information and knowledge management) is part of NDA's strategy. We will publish our revised draft Strategy for consultation on 5 January 2016. If you are interested in this area of our strategy and would like to send us your views, please sign up to our e-bulletin to receive email notification on the latest news.